+ One of the units is powering on but then "freezes up" and will not sync or power off. Replace the batteries with Alkaline batteries. (Three AA batteries for the Timer and Wand, three AAA for the Photocell, and one 9 Volt for the IRE). If the batteries are still good, remove the batteries for 30 seconds to reset the unit, then replace and try again. If this does not fix the problem the unit will need to be returned for repair. + One of the units is powering down by itself. + One of the units is not powering on. + The Timer is missing starts from the Wand. Replace the batteries with Alkaline batteries. (Three AA batteries for the Timer and Wand, three AAA for the Photocell, and one 9 Volt for the IRE). Use only Alkaline batteries, the system will not work correctly with dry cell. Check the power level on the Timer. If it is set to a lower power level, set it to a higher level. The high power settings are "ALL" and "DH". The low power setting is "SL". Make sure that the Timer is at least 25 feet (8 meters) away from the Wand. If the Timer is to close to the Wand it will be over powered and miss the signal. Keep two-way radios as far away from the Timer as possible. Try not to "talk over" the Wand (talking on the radio just after a skier is going throuth the Wand stick). If problem continues the system will have to be returned for repair. + The Timer is missing finishes, splits, or starts from the Photocell. 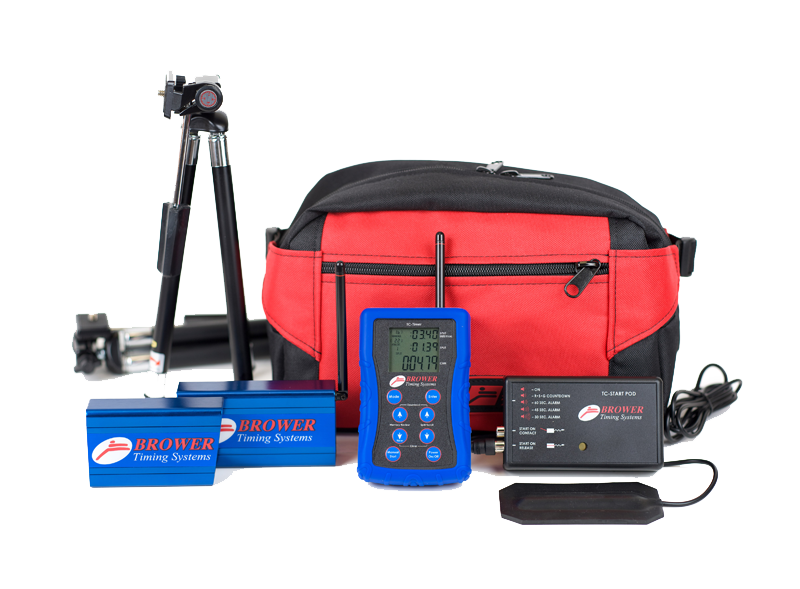 The only way a Brower Timer can start or finish is from a Brower Timing transmitter. If you are receive a start or finish that you do not beleive is yours either your beams are misaligned or there is another Brower Timing System in the area on the same channel as your system. Make sure the photocells are not synced as a start by breaking the beam and noticing if the clock starts. Resynce the system to a different channel. Increase the power level on your IRE to a higher setting. Re-align the Photocell with you IRE as described below. Check the batteries on the IRE and the Photocell, if low replace with fresh alkaline batteries. Resynce your system to a different channel. If problem continues the beam set will need to be returned for repair. Tip: When aligning the beams direct the IRE toward the Photocell until the Photocell stops beeping. Rotate the IRE to the left until the other unit starts beeping again then back until it stops beeping. Note this position then rotate the IRE the right until it starts beeping. Rotate the IRE to the middle of these two positions. Repeat this process for vertical postioning. + One or all of the units is not syncing. Check battery level the batteries with Alkaline batteries if needed. (Three AA batteries for the Timer and Wand, three AAA for the Photocell, and one 9 Volt for the IRE). Check USB cord for wear. If problem continues return unit for repair. + Clock will not turn on. Push and hold the outer 2 buttons to reset the clock. The tripods will wear out with use. Because of this, we suggest that facitlies have back-up tripods. Tips: The legs on the tripods are removable and can be used to replace broken legs. If you are having problems with tripods breaking frequently, there are more durable solutions available at any local camera store. + Touchpad will not start the clock or starts it inconsistantly. The touchpad will not start or stop the unit. Unplug the touch pad and wire, then trigger the beam by passing a hand infront of it. If the clock starts when the wire is unplugged, but does not start when the wire is plugged in, the wire or the touchpad is worn out. There is a delay from when the touchpad is released, to when the clock starts. The switch in the touchpad is worn out. The touchpads wear out with use. Because of this, we suggest that facilities have back-up touchpads. See replacement parts for prices on touchpads. + Unit will not start or stop the clock. + The unit beeps seven times quickly when it is powered on. This is the low battery indicator. Replace the batteries with a 9 volt alkaline battery. + Unit will not stop buzzing or crackling. The wired unit both sends and receives an infrared beam. When an object crosses in front of the beam, it is reflected back to the unit and the unit beeps to signal that it is recording a time. The beam will reflect off of any object that is closer than 25 feet in front of the beam. Make sure that there is nothing within 25 feet of the beam. Make sure that there is a fresh 9volt battery. (Refer to instructions). If the unit still is not working, it will need to be repaired. Tips: Place a cone 25 feet across from the beam to represent a finish line. This will keep people from passing to close to the unit and causing a false trigger. + Unit will not power on. Make sure that nothing is plugged into the unit and press and hold the power button for 4 seconds. Replace the battery with a fresh 9volt alkaline battery. If the current battery is new, remove the battery, wait 30 seconds, then replace. If the unit still will not power on, it needs to be returned for repair. Make sure that all of antennas are propertly attached to the units.